Fujitsu Laboratories Ltd. announces the development of automated analysis technology that can identify the cause of response deterioration and other performance degradation in virtual desktop systems. Fujitsu Laboratories has now developed the industry's first technology that monitors packets on the network to analyze bottlenecks caused by storage without impacting system operations. In addition, by combining this technology with its previously developed virtual network analysis technology(1) , Fujitsu Laboratories has developed an analysis technology that can automatically identify bottleneck locations when performance degrades in virtual desktop systems. In a trial of this technology in a prototype system under an environment operating 300 virtual machines (VMs), the time needed for the series of tasks performed by an operations manager related to identifying the cause of performance degradation, namely, estimation, impact investigation, reproduction, and analysis, could be reduced to approximately one-tenth that had been required. Previously, there were many cases in which problems could not be identified with a single analysis cycle, and it was necessary to repeat the tasks about three times. This technology, however, can identify causes with just one cycle, as the system accumulates, from a few weeks' worth of data, only the amount of information necessary for performance analysis. It can then comprehensively analyze it. With this technology, not only is the burden of work on virtual desktop system operations managers greatly reduced, systems can operate with greater stability than ever before, which can be expected to reduce uncertainty for customers considering deploying a virtual desktop system. Going forward, Fujitsu Laboratories will undertake a field trial of this system in a larger-scale virtual desktop system, operating on the order of several thousand virtual machines, with the goal of making it available as a service to be offered by Fujitsu Limited in fiscal 2018. Details of the results of the trial of this system will be presented at the 10th ACM International Systems and Storage Conference (ACM SYSTOR 2017), an international conference about storage being held in Israel on May 22-24, 2017. Virtual desktop systems, which offer high security while also enabling people to work without regard to location, are continuing to spread as an important part of ICT infrastructure in order to support the activities of diverse personnel, making the stable operation of virtual desktop systems very important from a productivity maintenance perspective. At the same time, such problems as degradation in response times or session termination occur due to a variety of causes, such as a temporary concentration of OS and application updates, an increasing number of users, and changes and enhancements to storage system. This creates a significant burden for system operations managers in identifying and resolving these issues. In order to identify the causes of performance degradation in virtual desktop systems, it is necessary to comprehensively evaluate the status of the servers, storage and network, as well as the systems that virtualize them, and identify the location and cause of a bottleneck. To do this, operations managers identify a likely location, enable collection of detailed statistics and logs and then analyze them to find a cause. However, as this analysis can increase the process load on components, causing a further degradation in response, it was necessary to spend time and effort repeatedly analyzing while minimizing the impact on the system. Storage, in particular, is often congested due to access concentrations, such as the start of work or updates to applications, which have been a major cause of bottlenecks, but it was difficult to record this and analyze it through logs, because the access frequency was very high in order to read and write short data units. Now Fujitsu Laboratories has developed the industry's first technology that can analyze bottlenecks caused by storage by monitoring packets on networks for the virtual desktop system, and by combining it with its already developed technology for analyzing virtual networks between servers, it has developed a technology that can automatically identify bottleneck locations in virtual desktop systems (Figure 1). With this technology, operations managers can comprehensively investigate the causes of performance degradation and narrowing down, without spending time on separate processes to identify those causes, or adding to the burden on systems in operation. The features of these technologies are as follows. In storage networks, unlike networks between servers and virtual machines, most communications feature short pieces of data, so if all packets were monitored, the volume of data produced would be massive. Now, by analyzing the packet header (such as read/write type, data length, and ID) for input and output packets in storage devices, and not just deleting unnecessary data portions, but extracting only a series of behavior characteristics necessary for analysis, Fujitsu Laboratories has developed the industry's first performance degradation analysis technology that eliminates problems with data piling up. With this technology, it is possible to reduce the accumulation of data necessary to analyze storage performance, without harming the performance of the virtual desktop system. This technology was developed by applying previously developed virtual network analysis technology used between servers. For example, in a system operating 300 virtual machines, it was confirmed that this technology was able to reduce the accumulation of data over several weeks necessary for storage performance analysis to one-fifth what it otherwise would have been. 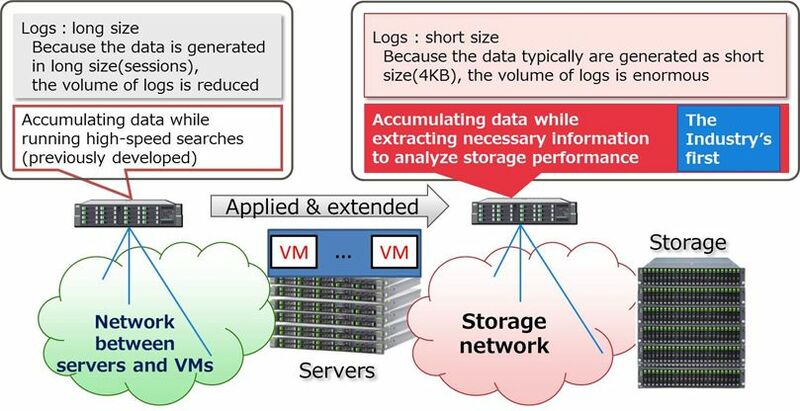 Now, with technologies that collect and analyze packets from two types of networks; storage networks and networks between servers and virtual machines, Fujitsu Laboratories has developed technology that accumulates data from about several weeks of activity, and automatically analyzes locations that are becoming bottlenecks in the system as a whole through a comprehensive relational analysis. By relationally analyzing storage status and the types of programs that were run, based on storage performance recorded as a time series, and analysis results for the network between the servers and the virtual machines, respectively, this system can comprehensively analyze the causes of degradation in the system’s performance without adding to the burden on the system. In a trial in a testing system environment operating 300 virtual machines, compared with experts who carried out a full series of root cause analysis, including estimation, impact investigation, reproduction, and analysis, to find the causes of performance bottlenecks over the course of about two days, this system was able to complete its analysis in about two hours, one-tenth of the time. With previous methods, there were numerous cases in which the problem could not be identified with just one analysis cycle, making it necessary to repeat the tasks about three times. With this technology, however, which can handle a comprehensive analysis, the issue can be identified in just one cycle. Fujitsu Laboratories will carry out field trials in large-scale virtual desktop systems operating several thousand virtual machines, in a move toward commercialization, with a plan to make it available as a service offered by Fujitsu Limited during fiscal 2018.